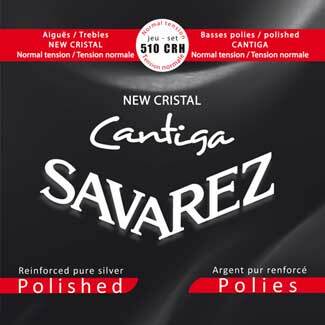 This new set of strings combines the proven SavarezNew Cristal trebles with the newPOLISHEDCantigawoundbasses. The polished CANTIGA basses with thepure silver winding on a new exclusive core offer much more advantages than the elimination of left hand noises. They deliver a beautiful, clean and colourful sound, a fast response and ease in playing. They are ideal for recordings and amplified performances on stage, and they will allure all the players who are looking for a pure sound free of left hand noises. They are paired with the praiseworthy New Cristal trebles in clear nylon to give a very well balanced set.